Kontron, a leading global provider of IoT/Embedded Computing Technology (ECT), announces for the first time two new modules in the Qseven form factor at embedded world 2018. 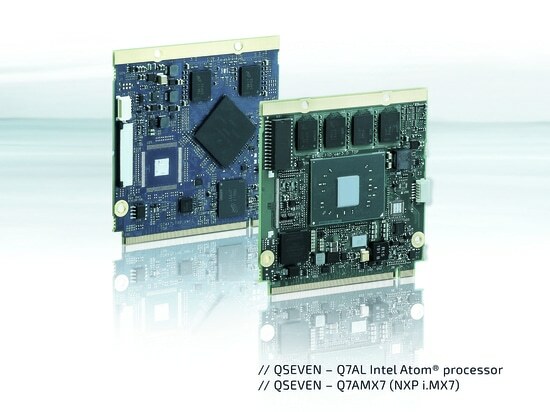 Depending on the requirements, the Qseven-Q7AL module is available with Intel Atom®, Pentium® or Celeron® processors, the Qseven-Q7AMX7 module uses the Cortex® A7 processor. 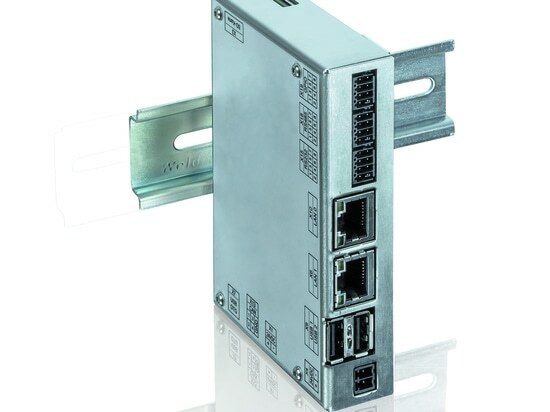 Both modules support the Qseven 2.1 specifications and are designed for use in industrial environments and at extreme temperatures. Kontron supports the Qseven form factor to address the installed user base of Qseven to provide a migration path towards modern CPU technology using Kontron products. 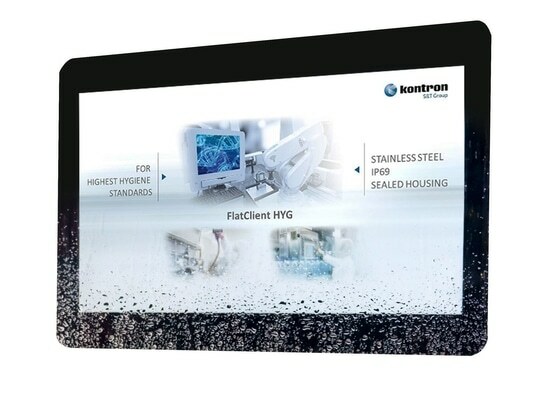 Kontron will showcase the modules at embedded world 2018, Hall 1, Booth 478. The Qseven-Q7AL module is available with Intel Atom® processors E3930 (Dual Core), E3940 (Quad Core) und E3950 (Quad Core) with up to 2.0 GHz. Thermal Design Power (TDP) ranges from 6.5 W to 12 W. Optionally, the module can be equipped with Intel® Celeron® N3350 (Dual Core) or Intel® Pentium® N4200 (Quad Core) processors. These offer 2.4 GHz at 6 W TDP or 2.5 GHz at 6 W TDP, respectively. The module can be equipped with up to 8 GByte DDR3-1867 (-1600) Memory Down (ECC in the variants based on Atom processors) and up to 32GB eMMC 5.0 Onboard Flash storage. The Qseven-Q7AL offers a ninth generation Intel HD Gfx graphics controller. The available interfaces include two SATA 6Gb/s, four PCIe 2.0, a serial interface, HD Audio, one I2S, one I2C, one SPI, one camera interface (2x MIPI CSI), one LPC, one CAN, two USB 3.0 (including USB 2.0), four USB 2.0, and an optional USB On-the-Go (OTG). It supports the Windows 10 IOT Enterprise and Linux operating systems. It can be run at temperatures from 0°C to +60 °C, or -40 °C to +85 °C for the Qseven-Q7ALi E2 variant. 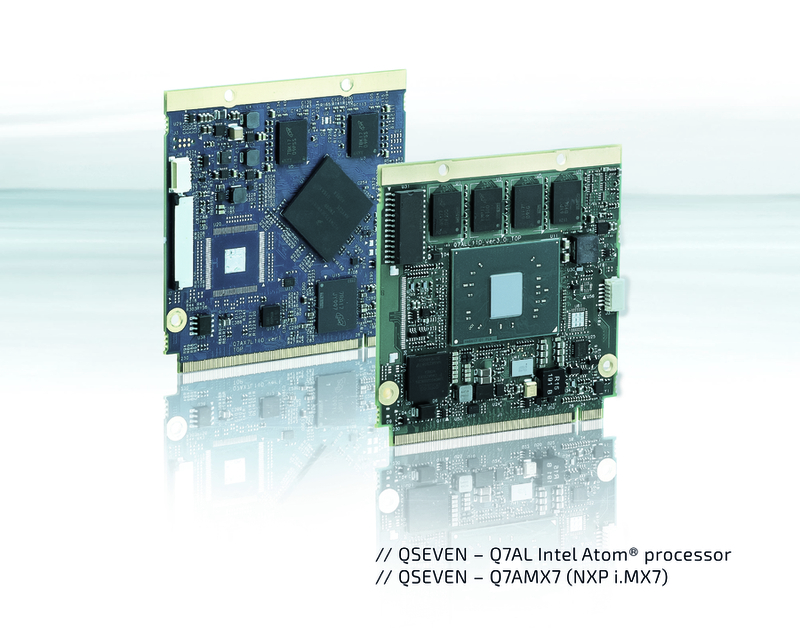 The Qseven-Q7AMX7 module uses Qualcom® / NXP Cortex® A7 Single/Dual i.MX7 processors. It features 2 GByte DDR3 RAM, two 64GB eMMC 5.0 Onboard Flash and supports two PCIe 2.0 with with Dual Core Processor. Other interfaces include up to five USB 2.0, one USB2.0 OTG, one serial interface, HD Audio, one I2S, one I2C, one SPI, one camera interface (2x MIPI CSI), eight GPIO [0:7] and one CAN. The module supports the Yocto Linux operating system. It is designed for an extended temperature range from -20 °C to +85 °C. Kontron has scheduled the release of further Qseven products in 2018, offering as well a broad portfolio based on the Qseven form factor to its customers. 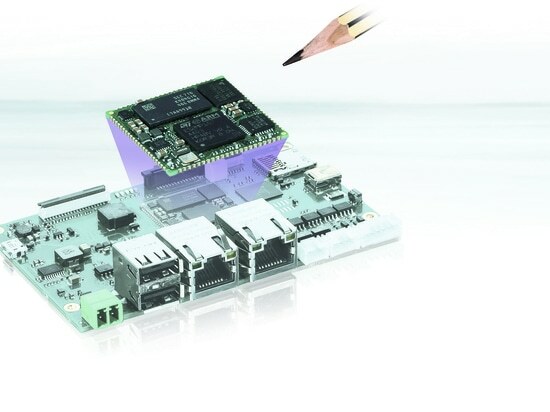 The Qseven-Q7AL module supports Trusted Platform Module TPM 2.0 on request. 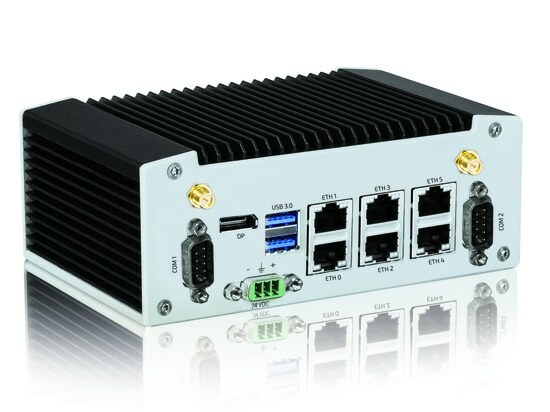 Both modules support the Kontron APPROTECT Security Solution. Based on an integrated Wibu-Systems security chip and in tandem with a specifically developed software framework, application can only be executed on pre-defined devices, furthermore it provides full IP and copy/reverse engineering protection. Kontron APPROTECT Licensing also provides license management to enable demo versions for limited time periods, or activation/deactivation of functions for a limited number of executions for new business models like pay-per-use.